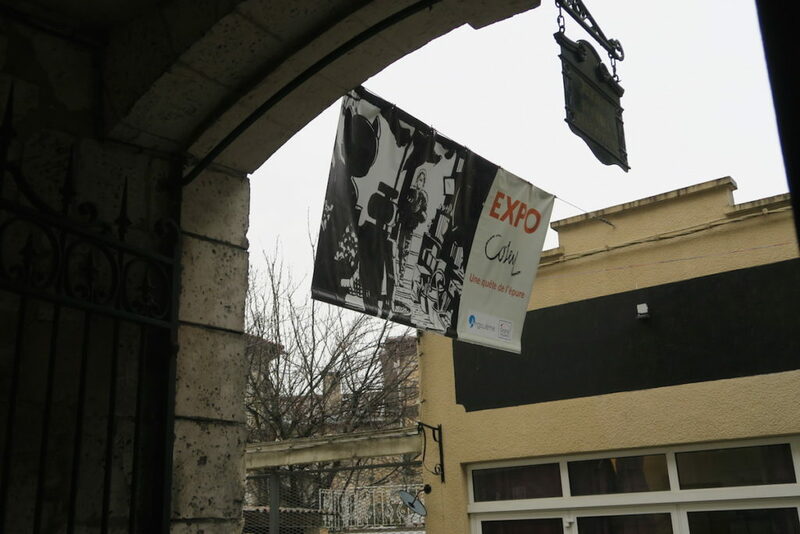 This year Europe Comics took its third annual trip to the Angoulême Comics Festival. Hope you’ve been following our daily diaries on Facebook, Instagram and Twitter, and here is a little recap of everything we saw and did this year. 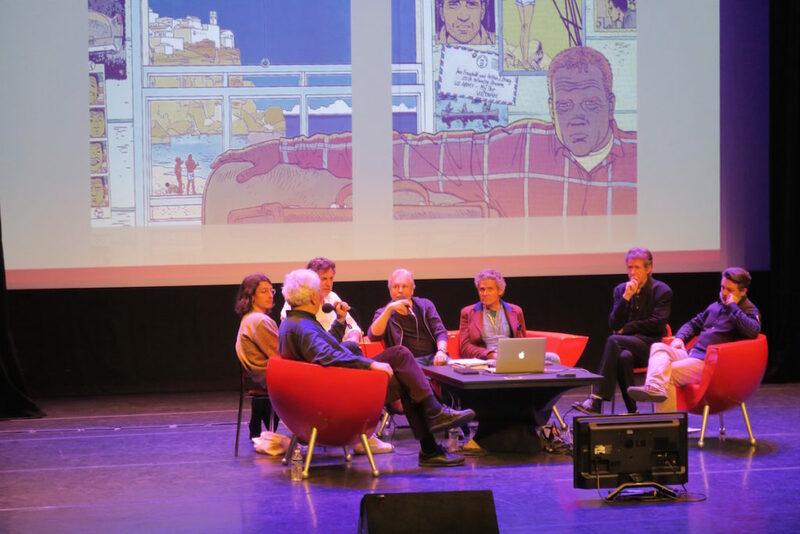 The 45th edition of the second largest comics festival in Europe was dedicated to last year’s Grand Prix winner Cosey. Therefore, the first stop on our schedule was the exhibition dedicated to this living legend of the 9th Art. Cosey has been an avid reader of comics since his childhood, however his work has mainly been defined by his more traditional literary tastes as well as his love of travel. The latter is particularly evident going through Cosey’s most popular work, Jonathan (Cosey’s dream alter ego). 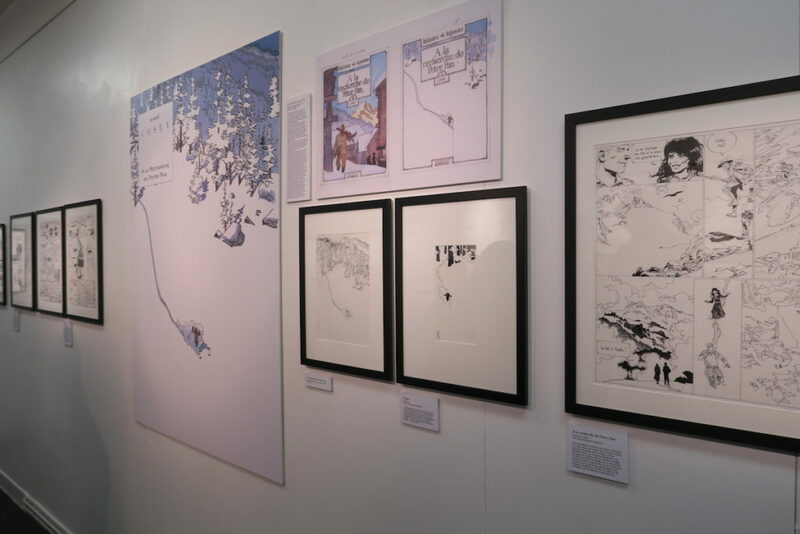 The exhibition also included original sketches and spreads from Cosey’s earlier work as well as his chef d’oeuvre, In Search of Peter Pan, which has proudly taken its place in the Europe Comics collection. You can see more pictures from the exhibition here. 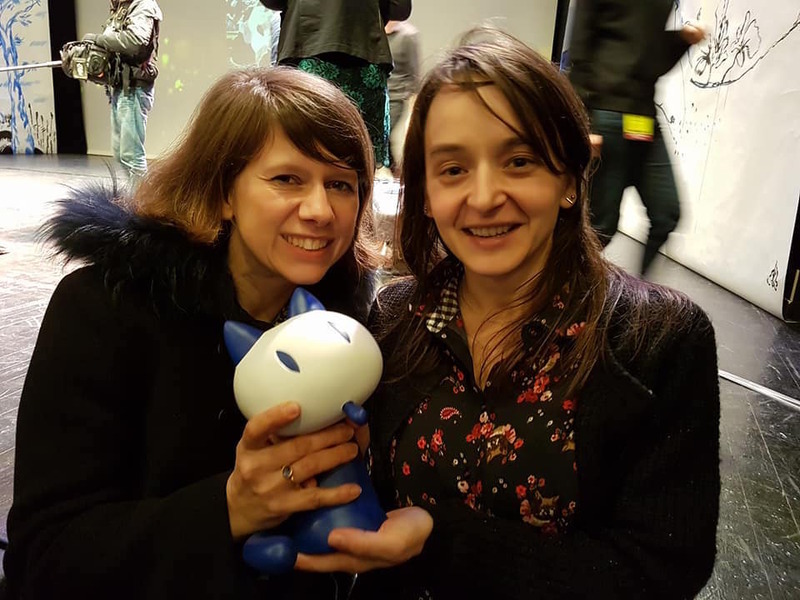 "In Search of Peter Pan"
After indulging in Cosey’s beautiful work we made our way to the main festival tent to see this year’s stands of Europe Comics partners Dargaud, Dupuis and Le Lombard. 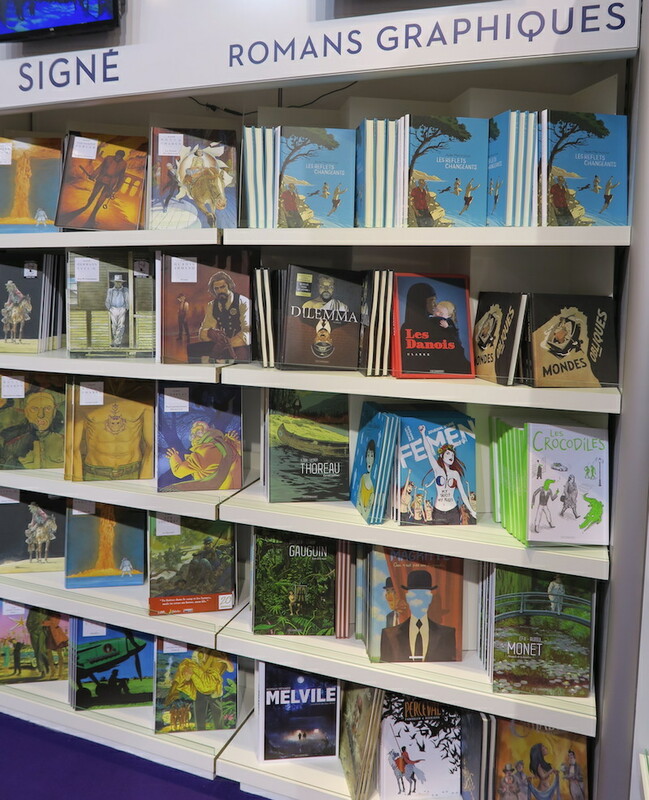 By that point all of the stands were already filled with excited crowds browsing through books and queueing to get signatures from their favorite writers and artists. 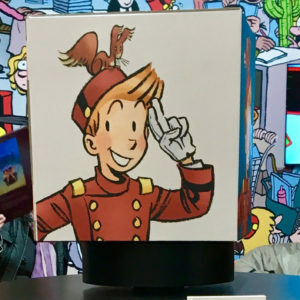 At the Dargaud stand we got a quick glimpse of Jul (Uh-Oh Plato! 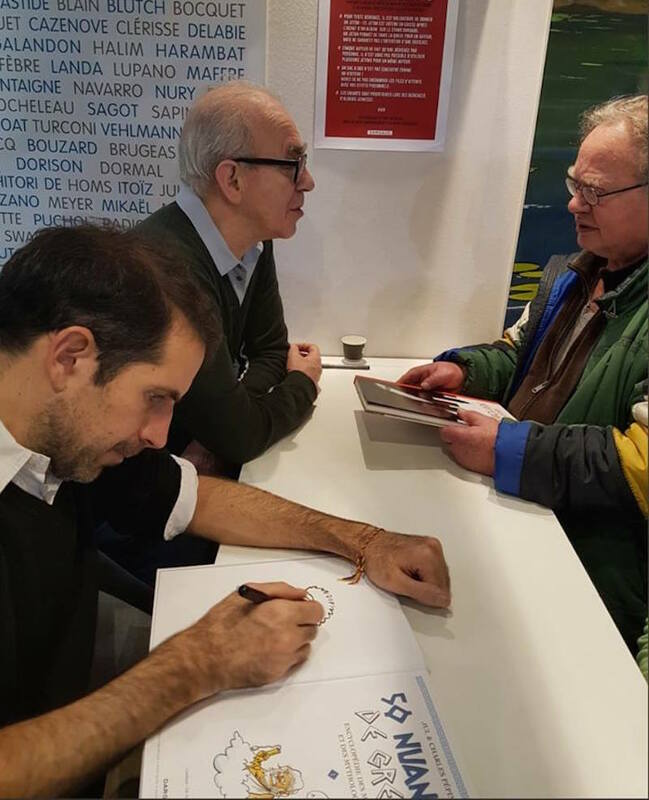 ), who was only doing one signing session this year and was then off to New York to participate in the Night of Philosophy and Ideas. We then headed to a meeting with our other Europe Comics partners — Dibbuks, Timof, Akan Ajans and Tunué — where we summarized all that we did in 2017 and made new exciting plans for 2018. More to come! The next day started with attending events dedicated to some current and future Europe Comics authors. First we went to see Blutch (Dark Side of the Moon, Goodbye Silver Screen, Modern Speed) do a live interview for French radio where he talked about his latest work, Variations, that was rightly in this year’s festival’s official selection. 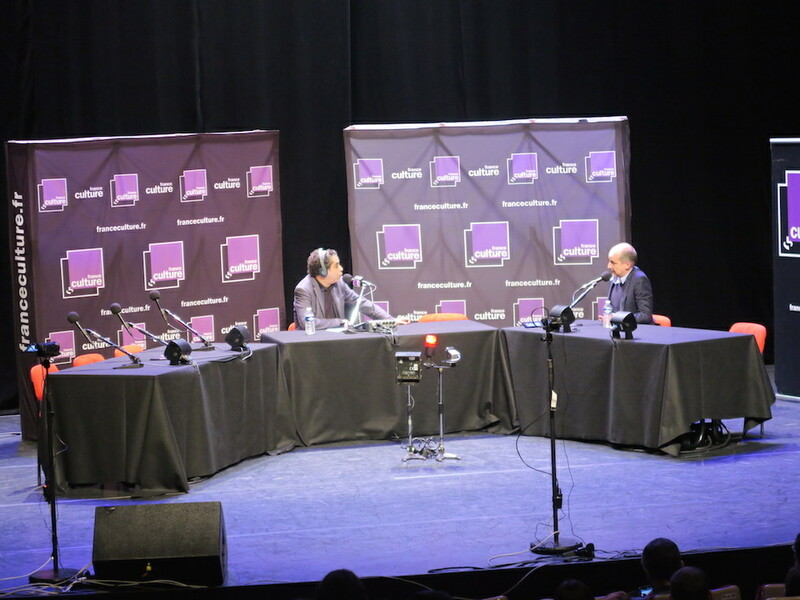 The next interview was with another nominee, Marion Montaigne, whose work Dans la combi de Thomas Pesquet went on to win the festival’s estimable Reader’s Choice Award. Marion is particularly well known for popular science comics, and we are pleased to report that her now award-winning reality-based work about astronaut Thomas Pesquet and his mission aboard the International Space Station is making its way to the Europe Comics collection! 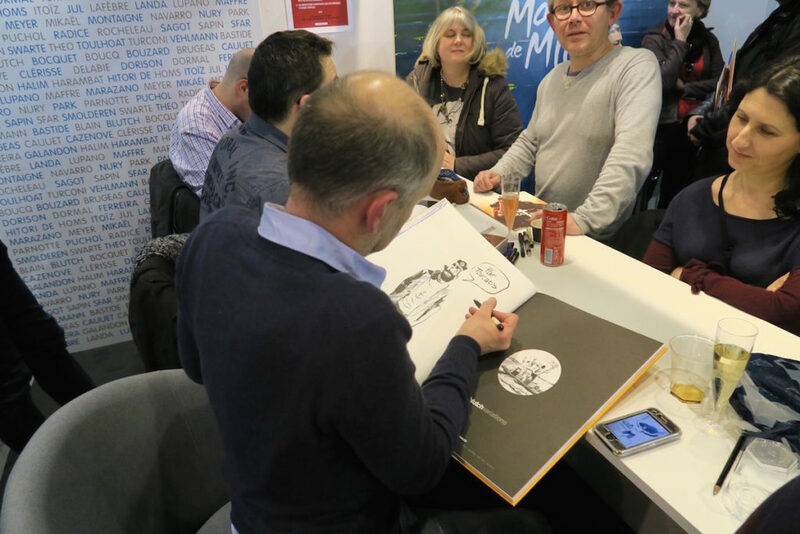 We then went back to see more authors in action at the Dargaud, Dupuis and Le Lombard stands including the artist behind SHI, Josep Homs; Blutch; the creators of Old Geezers, Wilfrid Lupano and Paul Cauuet; the artist behind FRNK, Brice Cossu; as well as the artist of Arthus Trivium, Juan Luis Landa. See more pictures of authors and their excellent drawings here. 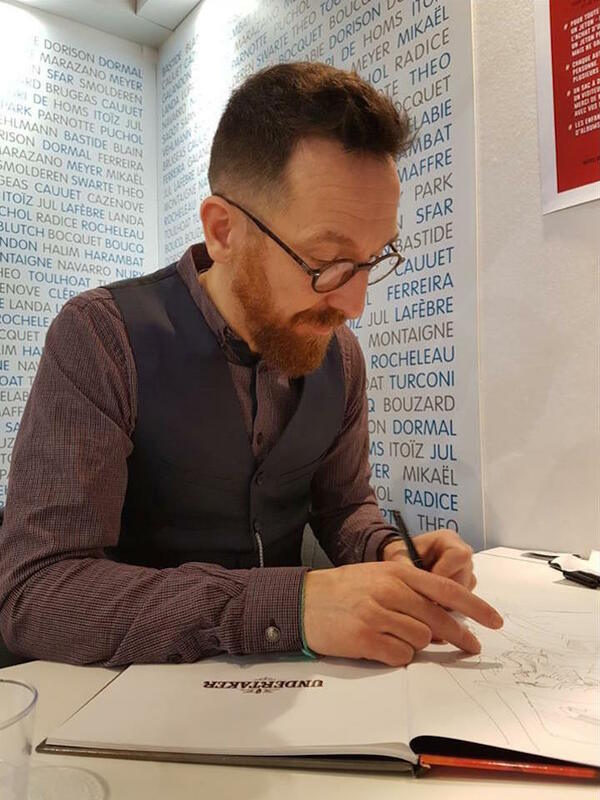 We also had a chance to sit down with Mikaël, who traveled all the way from Canada to promote the second volume of his love letter to New York, Giant. You can read our interview with Mikaël here. The day ended with a mesmerizing concert with Ruben Pellejero (Summer of Irreverence, Rain Wolf) drawing to the sounds of Rokia Traore. You can watch the recording of the concert here. 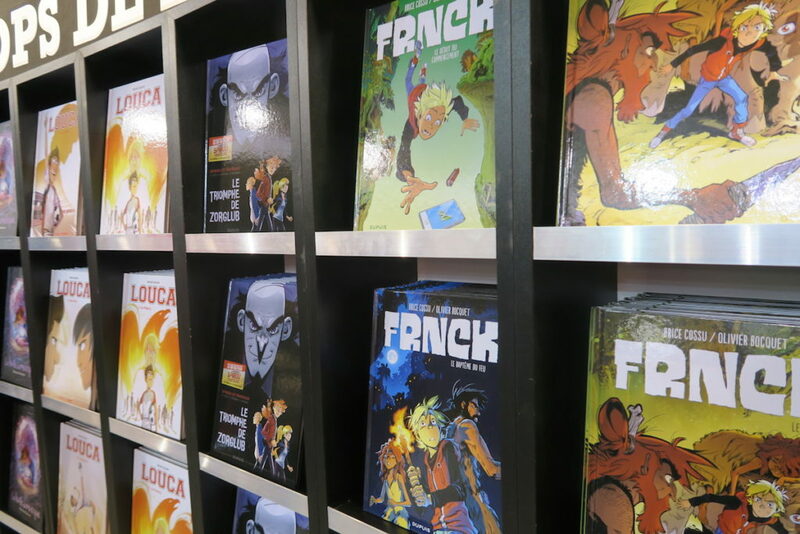 We started the next day with the lovely creators of FRNK, Olivier Bocquet and Brice Cossu. 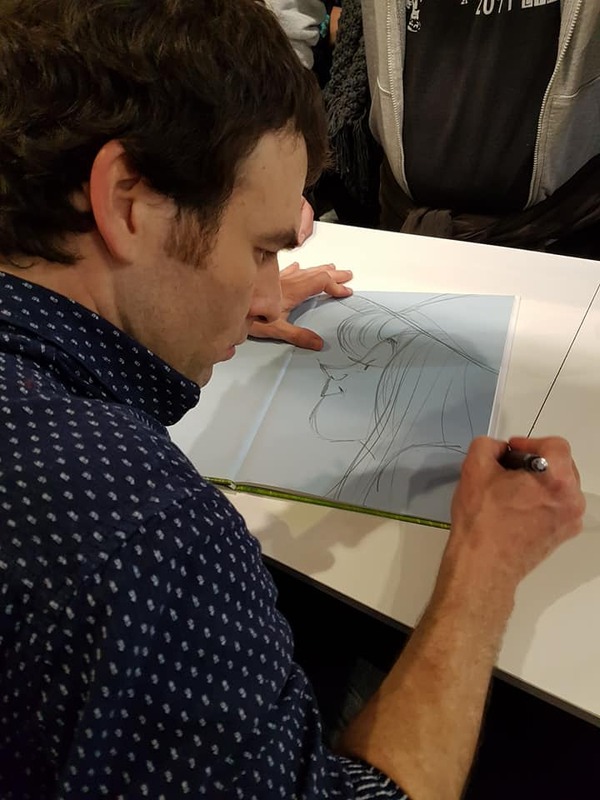 Olivier told us how he came up with the story of FRNK while Brice talked about the process of illustrating Olivier’s ideas. Read the full interview here and make sure to catch up with FRNK in volume 2. 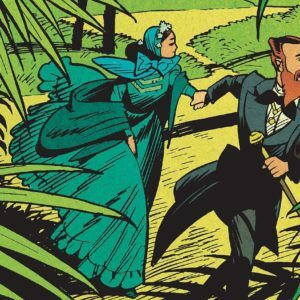 Our afternoon was dedicated to Aire Libre, an imprint of Europe Comics partner Dupuis that brought to life such wonderful books as Cyril Pedrosa’s Portugal and Gibrat’s The Reprieve. 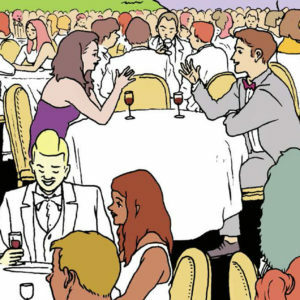 One of the latest books to come out from Aire Libre is also one of the latest releases in the Europe Comics catalog, Black Cotton Star by Yves Sente and Steve Cuzor. 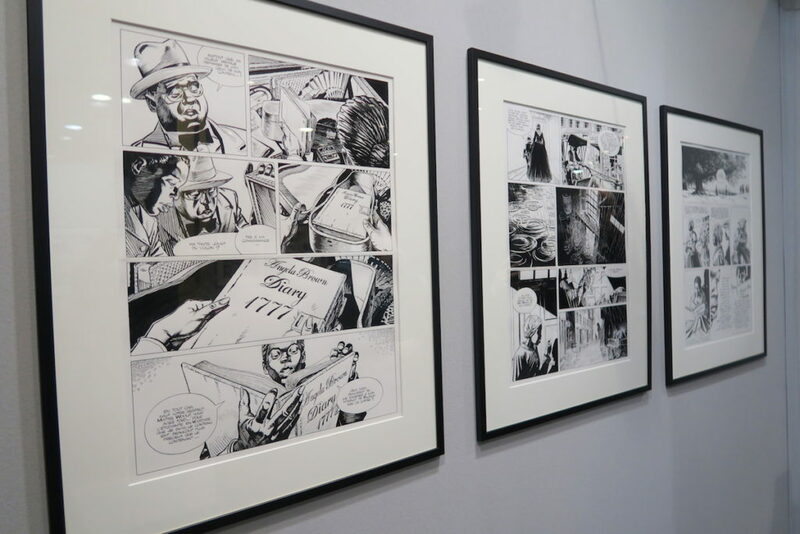 Original sketches and pages from the breathtaking saga, which depicts Second World War events parallel to the events taking place in 1776 Philadelphia, were on display in the Aire Libre gallery. You can see more pictures from the exhibition here. We then made our way to the Espace Franquin where Aire Libre organized a conference with some of its star authors including Cosey (In Search of Peter Pan), Bastien Vivès (For the Empire), Steve Cuzor (Black Cotton Star), Jean-Luc Fromental (The Czech Coup) and José-Louis Bocquet (Le Privé d’Hollywood). 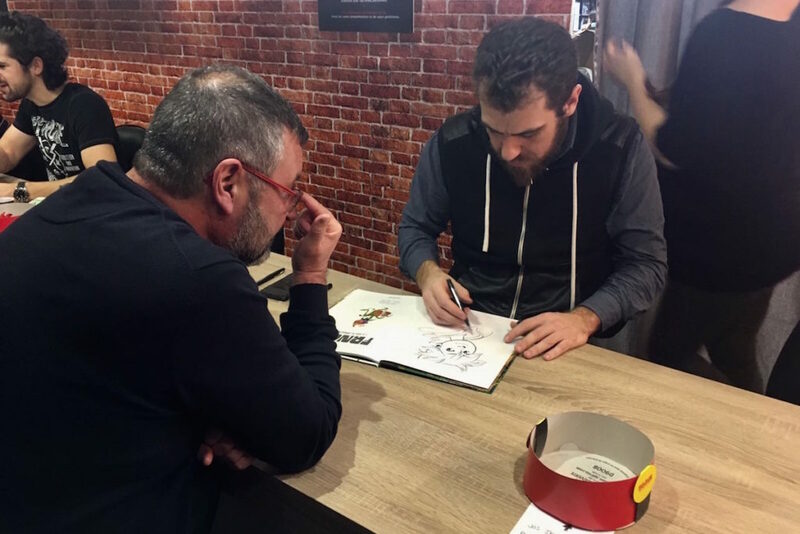 After the Aire Libre conference there was one more stop on the Europe Comics schedule, a sit-down with the extremely talented and delightful Jordi Lafebre, illustrator of Vice Squad and Les beaux étés (both written by Zidrou). 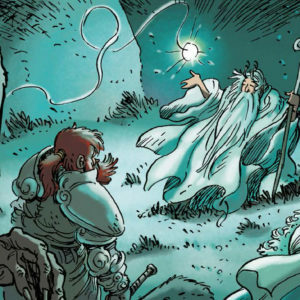 Les beaux étés is coming to Europe Comics this May, so we were curious to know what we can expect from Jordi and Zidrou this time. 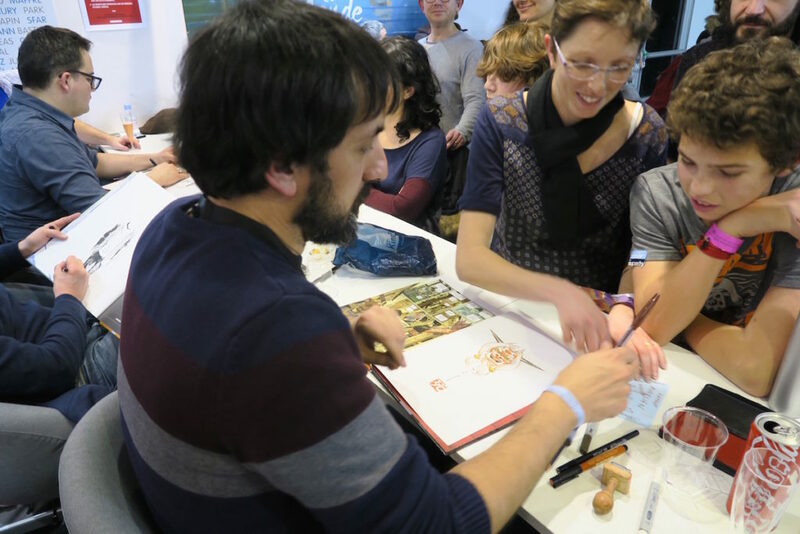 We also learned about Jordi’s influences and work methods, which you can read more about here. 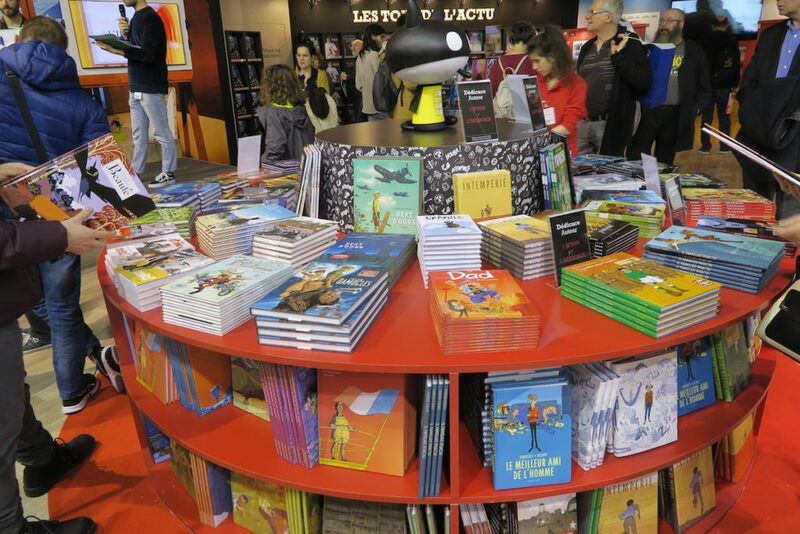 That was it for us and our third visit to the French capital of comics. 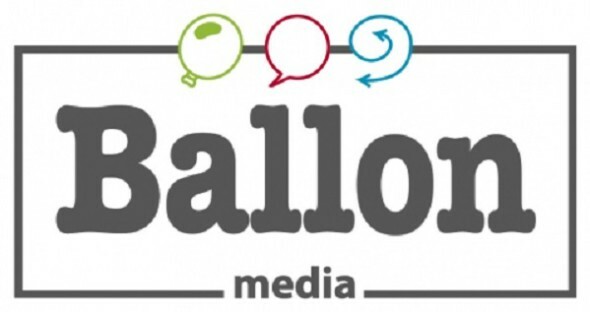 We already look forward to next year’s edition and what it has in store for us!